Groupon proving the daily deal bubble has burst? Daily deals site Groupon has announced in its fourth quarterly financial report that it is actually making a loss, despite the popularity of the service. Given that Groupon is the most popular of the daily deal websites, its revelation that it actually made a $43 million (£27 million) loss in its fourth quarter does hint that everything isn't as rosy as it seems in the wonderful land of daily deals. Groupon did note that its revenue was up by a significant amount – 194 per cent year-on-year, which equates to $506.5 million (£320 million) – but the bottom line is that everyone who bought shares in the company is now $0.08 per share worse off. Speaking on the earnings call, CEO Andrew Mason said, "Groupon had a strong fourth quarter and we finished 2011 having helped 250,000 local merchants across 47 countries grow their businesses while saving Groupon customers billions of dollars." 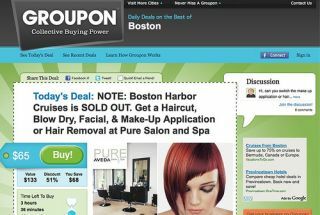 It's not all bad news for Groupon – the company is hoping that it will up its revenue in the first quarter of 2012 by an ambitious 73-86 per cent.